Mentioned is the way you can write. People looking for jobs can easily download these Bachelor of Commerce (BCom) CV Template in word or pdf format or just view it online to copy and paste. 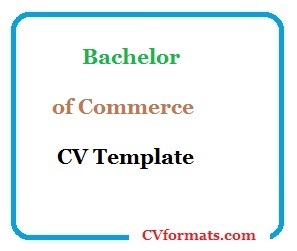 Cover letter of Bachelor of Commerce (BCom) CV Template is also available. Just change the name , address , qualification and experience and your Bachelor of Commerce (BCom) CV Template is ready. I am a student of Management & Business Administration who is strongly ambitious to learn, grow and succeed by fair and ethical means. I am able to think on my own feet, posses a sense of responsibility and have a “can do” attitude. I am a sort of person who has the natural ability to provide excellent service within a challenging environment. I did Masters in English Literature so for that I need a Professional CV Template.